Super-size it! That’s something Nancy rarely said at a restaurant, but often when quilting. Nancy started with a traditional quilt pattern and expanded the size. 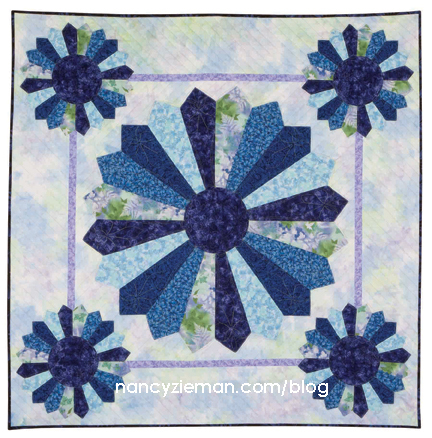 This no-fat super technique adds drama to a quilt project, but also saves time on piecing. Over the past Sewing With Nancy seasons, Nancy recorded several episodes featuring super-sized quilts. She decided to include her favorite dramatic quilts in the The Best of Sewing With Nancy’s Super-Sized Quiltsseries, bringing back the recorded segments from past shows. Find the complete two-part series book at Nancy’s Notions. Early in her quilting career, Nancy made a Lone Star Wall Quilt as a wedding gift. Nancy almost didn’t give the gift away, as she was somewhat embarrassed that not all the seams met in the center. After all, she was Sewing With Nancy, what would people think! Later Nancy became eager to show you the same quilt block, this time with a technique that’s practically guaranteed to cause pride, not embarrassment. Nancy broke the rules and shared her tips with you in the The Best of Sewing With Nancy’s Super-Sized Quilts. Whether you choose a traditional arrangement or mix it up a bit with a contemporary design, these quilts can be easily created without Y-seams. Both quilts are variations of the Lone Star block, which is based on eight pointed diamond shapes. All of these quilts are made with a template trio, Trace ’n Create Lone Star Template. The title of this quilt design is Sew Grand Dresden. Nancy looked back over past Sewing With Nancy titles and realized that she never used the word grand before! With meanings such as majestic and impressive, it sounds a bit boastful. Yet grand appropriately describes the large, 38″ Dresden plate appliquéd in the center and four 16″ Dresden plates, that frame the center motif. The larger Dresden appliqués can be stitched in approximately the same amount of time as smaller blocks, one of the bonuses to super-sizing your quilt blocks. Dresden wedges can easily be created in any size with the help of Sew Grand Dresden Templates. Although one of the most recognizable traditional quilt patterns, Dresden designs can also shine in a contemporary setting. In this next quilt, Twirling Parasols, Nancy used only solid fabrics to create a color-blocked background and Dresden wheels. Notice how the same colors were used in the background and foreground; this creates the illusion that the foreground shapes are floating. While fantastic for appliqué and larger quilts, Dresden designs look great in any circle or round project including table toppers and Christmas tree skirt designs. Use the book from this two-part series to create the quilts. Watch The Best of Sewing With Nancy’s Super-Sized Quilts (Part One and Part Two) on Sewing With Nancy online. For a chance to win a, Trace ’n Create Quilt Templates Lone Star Collection, from Clover, leave a comment below sharing what quilting project you’ll get started on this spring. 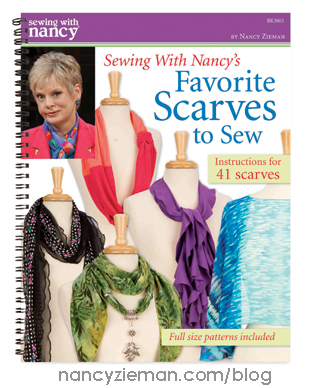 The randomly selected winner of a copy of the book, Sewing With Nancy’s Favorite Scarves to Sew from Nancy’s Notions, is Noreen. Her comment is: I like the square scarf – it’s so versatile. There are a lot of great scarf ideas in the book, and I would like to try several of them. I will be working on a quilt for my granddaughters graduation gift. Her color is purple! I can’t wait to make Twirling Parasols. I bought Nancy’s Star and Dresden templates at the WPT Expo about 4 years ago. Haven’t used them yet; the hardest part will be choosing what fabrics to use from my store (stash). Love the concept of big blocks to use up the most fabrics as possible. Must order the books! I’d love to make the large dresden plate table topper. It would look great on my table. My first quilt was a supersized Lone Star made with 4 colors. I still have it with broken seams, ripped connections, and torn ties! My mom started a Dresden Plate and I’m trying to get some templates to finish it up. Still love reading about all Nancy did in her lifetime. I’ve never done any quilting, but I always thought it would be fun to try. The dresden pattern can produce a variety of looks from old fashion to modern. I would enjoy making a wide variety of items with the dresden plate. I have always wanted to make a Dresden Plate Quilt. The lone star in solids is on my bucket list for this spring. This template set would be handy to make it quicker and less tedious. I am just finishing a quilt of Valor and am ready to do some spring florals. Something bright and lively. Would love to have the lone star or dresden patterns. I’ve been working on Christmas materials for 18 placemats off and on for two years. I made stripes of different widths in black, white and red patterns. It’s so busy, but I thought if I could use the lone star templates then it would make an amazing quilt! My snowman material would be in the center and the stripes of white with my red snow globes near the edges would make this material pop without being busy. I hope I win this! I would love to work with this set. I just love all thse past episodes. I miss Nancy so much. I am going to make the grand Dresden as a table cover. Cannot wait to get started. Thanks for all your ideas! My son loves the lone star,so I would make a sampler quilt for him. His birthday is coming up in May. I will be making a quilt for my DIL. She loves butterflies so the fabric will include those but I have not decided on a pattern yet. I will start working on a quilt called Chicago III for my quilt guild. will have fun doing it. I really like the Twirling Parasols quilt! The colors shown are fantastic also, it looks so fresh and modern! A good reminder spring is on its way. I would love a template set for the Lone Star quilt. I need a quilt in tones of blue for my newly decorated guest bedroom. I’m hoping to start a stain glass quilt, my first QAYG. A bit nervous but going to get my feet wet. I think I will make scrappy rainbow quilt. I am ready to work with some Springtime florals–they would be pretty in the Dresden pattern. I would absolutely love to make s large sized Dresden quilt. I would like to make a scrappy Dresden quilt. The Dresdan plate table topper is a project that I would like to do. Seasonal fabric choices could add to festive decorating. I would love to make a Lone Star quilt and a Dresden table topper. Thank you for the opportunity to win the template. I have so many UFOs that I’m motivated to get back to working on that I don’t know that I’ll start a new project, though one never knows for certain, lol. Priority is my Tone It Down Burgoyne Surrounded. Only halfway on the quilt top and I’m already thinking about enlarging it with additional blocks. I have never made a Lone Star and would love to win these Clover templates. I think I would choose the lone star quilt block and Nancy makes it look so easy. I’d start with Lone Star! I’d love to try the Dresden plate quilt. It’s very beautiful. Of all the quilt patterns I have, I think I would love to have the Lone Star. Thank You in advance. I am currently homeless and have ptsd and am autistic. I love to sew and do crochet as therapy, but have to keep my work small, so my next quilt project is going to be a yoyo quilt. Maybe by the time it’s finished I’ll have a roof of my own over my head. At the top of my project list is a Lone Star quit. I have always admired Lone Star quilts, but considered them too difficult for my quilting ability. These templates would definitely simplify the process. I like the Dresden Plate pattern, and would start with a table topper. Dresden plate as a table topper. Love all of the patterns. Dresden Plate – my favorite of all patterns! I plan on making a dresden table topper for my dining room table. I think it will be perfect for a bouquet of cut flowers from the yard. I’ve made traditional Lone Star quilts in the past. I’m looking forward to trying one using your new technique with no HSTs! Love the Parasols quilt! I’d like to make one for our Daughter for her Graduation~ Thank you! I’ve got a summer quilt with hot air balloons that I’d like to work on this spring. It’s so hard to decide…..one of each is my only choice. I love Lone Star quilts but have never dared make one. Perhaps this is the technique I need to use to make my dream of making a Lone Star quilt come true. I hope to cut out a carpenters star, queen size, in red, black and gray for my grandson. I plan to make a Dresden Plate sunflower table runner. My daughter finally has her own dining room and accompanying table. I’ll be making table runners and/or centers for all seasons and occasions for her. She loves everything I make for her, no matter what or how intricate it is. Got to love a kid like this! The Dresden is beautiful!! Definitely on my list!! I am just now starting a quilt for my son and his future wife. They are getting married in July so I need to get moving. I also need to make my granddaughter a quilt for a house warming gift. Her and her fiance just bought a house. I will keep busy with those two quilts and when finished I will start on 2 wedding quilts, 1 for my granddaughter and 1 for another son. Both are getting married next year. I am a Texan and I love the lone star quilts. I have been wanting to make one for several years. I have the material to get started hopefully with the help of your amazing templates. I am a Texan and I love the lone star quilts. I would love to make one for my bed. I have all the material just need the fantastic templates you are offering and I can get started on my lone star quilt. thank you for the opportunity to win your amazing products. The first quilt I think it’s the lone star quilt I would love to make so very big and pretty. Now that I live in Texas…I want to make a Lone Star quilt. My new spring project is a baby quilt for grandaughter. The modern Dresden is on my bucket list. I am helping my daughter make a modern log cabin this spring. Tough call because I LOVE ALL that Nancy does!!! Miss her SEW much! Thanks for a chance to Win this! I’d have to say — Dresden anything would be my biggest draw in!!! I have never done it yet and love the look!!! God Bless! Good Luck to all! I would like to try the Lone Star! Dresden Plate and then, the scary Lonestar I love! I’d like to get a plus quilt done in the spring. I’ve had the fabrics put aside for a while now so it’s about time to get started! The Dresden plate pattern fascinates me and is #1 on my list. I have 50+ Sewing with Nancy on my dvr. I love the Sew Super Size quilts & this terrific ruler. Gone but not forgotten. I live in TX. I think the Lone Star Quilt is calling me! I have always been afraid to try the Lone Star because of the Y seams. This approach makes it look like a Lone Star is in my future. I would like to make the Lone Star Quilt. I have admired it for awhile. I have always wanted to make a Lone Star quilt, but it looks so difficult! I’d like to try this. When I machine tack down my binding I stitch from the top of quilt in the ditch of binding and match my bobbin thread to the binding on the back. It requires a lot of pinning to be sure your binding is wrapped over the back where stitches will catch it, but results are great, and nearly invisible on quilt top. I just finished a quit for my new great granddaughter. I am going to make another baby quilt for my newest great niece born one week after my great granddaughter. Then I am going to quilt just because I enjoy it. Lonestar. I have always wanted to make one, but intimidated by the seam matching. I want to try this while I am still able to sew. These giant Dresden are fantastic! I’ve made a Dresden quilt but not on this scale. I’m really looking forward to making a giant Lonestar. I would love to try this with ties. Too many designs to make. I would make the 3D lone star quilt. Grand Lone Star Quilt is something I would love to make. I would love to make the lone star quilt. For my new home, will be making a cozy tablerunner. The beginning of happiness! I love Nancy’s large lone star and the idea of making large Dresden plates. Her technique is truly one I must use. The large lone star is on my list for spring. Just need to chose my colors. I love would love to make a Grand Lone Star quilt. I would like to do one of the dresden plate quilt. The are beautiful. I love the super sized quilt blocks! I used one of Nancy’s designs a few years ago for a t-shirt qt. I would like to make some home dec items to keep this Spring, because I usually give things away. I love anything dresden. I would love to make Christmas tree skirts for my kids. I am working UFO kits, three completed more to go. I love the Dresden plate pattern. I have been collecting 30′s fabrics to make a large Dresden plate quilt. Thanks. I love the Dresden pattern and probably would start with a table topper! I have nothing specific at this time, but will work on things that I can make from my stash. Might get an early start on Christmas gifts. I want to make a couple of Christmas tree quilts for my kids. They have fond memories of going to pick out a Christmas tree, so a quilt to have with that theme is on my list. I would like to make the Lone Star using your template. I will be working on an applique wall hanging of a summer scene. The lone star quilt looks interesting. I would like to do a tie quilt ! I think it would be interesting and beautiful and Nancy’s wonderful projects always !! Help me !! My spring project is a mini quilt for a swap. I am a gadget gal. I love gadgets. I especially specialty rulers and templates. The Clover Lone Star templates are intriguing as a Lone Star quilt is definitely in the future soon.